So the kids go back to school this week in Australia and NZ and we say adios to another summer. Up here in the deep north it’s as cold as a Mother-In-Law’s stare but the good news is we’re past the Winter solstice and it no longer gets dark at 4.30. 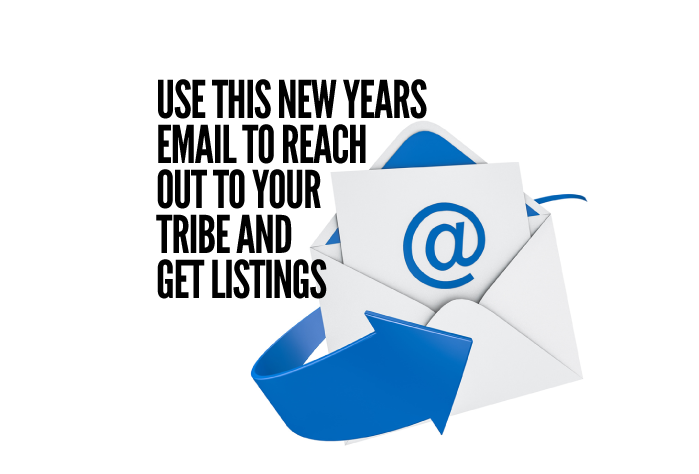 I’ve been sharing the follow NEW YEARS EMAIL with my private coaching clients to shake things up a bit in the first quarter. I would suggest you A. Send one of the two emails below to your whole list and B. Follow up the next day with phone calls. If you have a big list (like you should) you’ll have a few weeks worth of calls to make but I will guarantee you’ll get some ‘go sees’ and listings out of it. Don’t forget, the mission is to get your email opened so short and sweet is best. By the way, when I use me contact’s first name in the email subject, my open rate is considerably higher! We’ve hit the ground running this year and I just wanted to connect and see what’s happening. We’re setting up our marketing campaigns for the first quarter of the year so I’m interested to know if you’re looking to buy or sell in the next few months. If you need a value update or some help with buying, please let me know. Call or text me on (number) or just respond to this email and I’ll be in touch straight away. Can you let me know if you’re planning to buy or sell in 2017? Either way, I have some great news.